Cardinal Timothy Dolan, the archbishop of New York, will be one of six faith leaders to pray at Donald Trump's inauguration. Evangelist Franklin Graham will follow his family's tradition of praying at presidential inaugurations when he prays during the ceremony for President-elect Donald Trump. He prayed previously at the 2001 inauguration of George W. Bush, and Graham's father, Billy, prayed at the inauguration of several presidents. The six faith leaders President-elect Donald Trump has invited to pray at his inauguration come from diverse backgrounds, but they have something in common: All have personal ties to Trump or his family or have in some way signaled their approval of him, his politics or his wealth. The group includes an African-American megachurch leader from Detroit, a Florida woman known for her lavish lifestyle and preaching on "abundancy," a rabbi from Los Angeles, and a Hispanic evangelical — as well as Franklin Graham (son of Billy Graham) and Cardinal Timothy Dolan, the archbishop of New York. Bishop Wayne T. Jackson, who leads Great Faith Ministries in Detroit, played a key role during the presidential campaign by inviting candidate Trump to visit his church. For Trump, it was a rare appearance before a black congregation. Presenting Trump with a Jewish prayer shawl during his visit, Jackson said, "There are going to be times in your life that you are going to feel forsaken ... but the anointing is going to lift you up." With his invitation to Jackson to pray at his inauguration, Trump returned a favor. Jackson lives in a multimillion-dollar mansion in Detroit and drives luxury cars. He preaches that being rich is not bad and that Trump's wealth shows he is "blessed by God." Such teachings exemplify the "prosperity gospel," which holds that God rewards faithful Christians with financial success. It is a faith tradition with which Trump long has been associated. His "spiritual adviser" is Paula White, who as the leader of New Destiny Christian Center near Orlando, Fla., is perhaps the best known prosperity preacher in the country. "Every day you're [living] your destiny, designed by God and discovered by you," White said in a recent sermon. "You're either in a position of abundance, you're in a position of prosperity, or you're in a position of poverty. Now that's in every area of your life. ... You're living abundant in your affairs of life — and that includes your financial conditions — or you're living in poverty." Not surprisingly, Donald Trump is drawn to those preachers who say that one's wealth is a sign of God's approval. Paula White has her critics in the evangelical world, some of whom consider her a heretic, but she endorsed Trump's candidacy, and he reciprocated by inviting White to pray at his swearing-in ceremony. Another pro-Trump evangelist who will be praying at the inauguration is Franklin Graham. During a recent interview with Lou Dobbs on the Fox Business Network, Graham said "the hand of God" was evident in Trump's election. "I think God intervened and put his hand on Donald Trump for some reason," Graham told Dobbs. "It's obvious that there was something behind this, and it was more than people understand. I just think it was God." By appearing at Trump's swearing-in, Franklin Graham will be following family tradition: His 98-year-old father, Billy, prayed at the inauguration of several presidents, from Richard Nixon to Bill Clinton, and Franklin prayed at the inauguration of George W. Bush in 2001. His inclusion as a prayer leader may also signal Trump's comfort with Graham's political positions. During his campaign, Trump focused a lot of attention on the threat from "radical Islam," a theme Franklin Graham also has emphasized. Shared political views may also explain Trump's invitation to Rabbi Marvin Hier, the founding president of the Simon Wiesenthal Center in Los Angeles. In a recent television interview, Hier said it was "outrageous" that the Obama administration chose not to veto a recent United Nations resolution condemning Israel's settlement policy, echoing Trump's own criticism. Hier, the first rabbi asked to pray at a presidential inauguration since 1985, says he will hit "modern themes" during his inauguration appearance. "It will be a short prayer, but it will reflect on the 21st century," he says. Hier also has ties to the Trump world through Jared Kushner, Trump's son-in-law and close adviser. Kushner's parents are old friends with Hier and his wife. One indication of Trump's unorthodox approach in choosing inauguration prayer leaders is the absence of any representative of mainline Protestantism, the dominant faith tradition of U.S. presidents throughout the country's history. On the other hand, Trump is the first to invite a Hispanic evangelical leader, the Rev. Samuel Rodriguez, president of the National Hispanic Christian Leadership Conference and senior pastor at New Season Christian Worship Center, an Assemblies of God congregation in Sacramento, Calif.
Rodriguez accepted the invitation despite some misgivings about Trump's hard-line immigration views. "There was a bit of angst due to the fact that throughout the course of this campaign, the rhetoric and tone, as it pertained particularly to the immigrant community, did not line up with the ethos or the values of the NHCLC," Rodriguez told NPR. He agreed to come to Washington for the inauguration after "prayerful deliberation and discussion" and a conclusion that he could not pass up an opportunity to pray on "the quintessential political platform on the planet." Among Hispanic evangelicals, Rodriguez is one of the more conservative leaders. While he did not endorse Trump, he told NPR that he has heard a "change of tone" from Trump in the past few weeks, and now has high hopes for better relations between Hispanics and the Trump administration. "Thirty percent of Latinos voted for Donald Trump," Rodriguez points out. "There's a great possibility that the president-elect and his team have come to the realization that this constituency could be engaged successfully." Generally, Trump's selection of inauguration prayer leaders reflects his tendency to break with mainstream thinking — and the importance he places on loyalty. With his invitations, he has rewarded clergy members who support him politically, endorse his views, or even offer a religious approval of his great wealth. 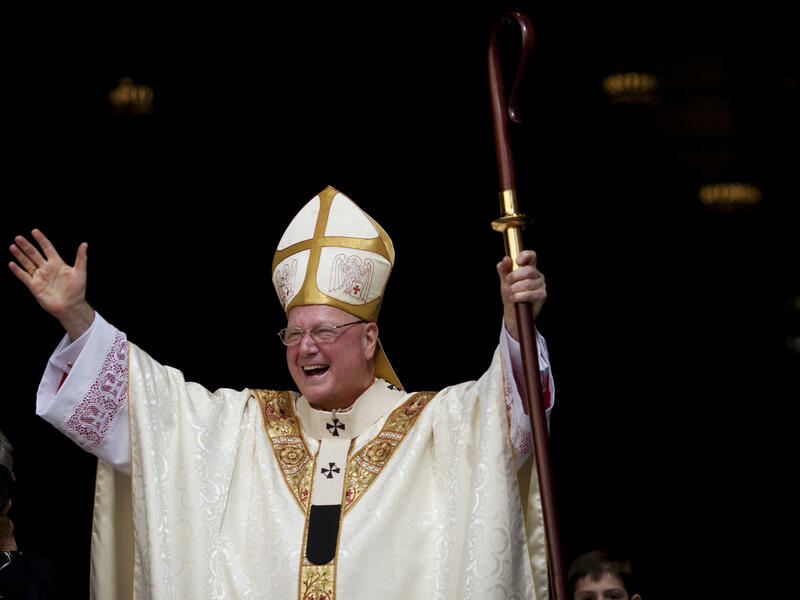 The least surprising prayer leader choice is Cardinal Dolan. Most U.S. presidents in recent years have asked a prominent Catholic bishop or theologian to pray at their inaugurations, and as fellow New Yorkers, Dolan and Trump have known each other for a long time. One week from today, Donald Trump will become the 45th president of the United States. We're going to take a look now at one group who will play a feature role during his swearing-in ceremony. The six members of the clergy will offer prayers and readings that day for him and for the country. NPR's religion correspondent, Tom Gjelten, says Mr. Trump's choice of these particular six faith leaders may offer hints about the president-elect's own values and beliefs. And Tom is in the studio to talk with us about that. Hi, Tom. MARTIN: Six is a lot - right? - traditionally for an inauguration? GJELTEN: Yeah. We've usually seen three or four at the most. This time we'll have five Christian leaders and a rabbi. GJELTEN: No, but that's not unusual at a swearing-in. MARTIN: All right. So let's go through these people. Who are they? GJELTEN: First, Bishop Wayne T. Jackson of Detroit. He's a prominent African-American minister, leads a big church conglomerate there with a television network. He played an important role in the presidential campaign. Remember, he's the minister who invited Donald Trump to his church, one of the very few black churches that Trump visited. WAYNE T JACKSON: Mr. Trump, will you come, and would you stand? Would you stand, Mr. Trump? DONALD TRUMP: Thank you. Thank you very much. GJELTEN: So now, as president-elect, Trump has invited Bishop Jackson to pray at his swearing-in next week, returning the favor. But there is something else. Jackson is a very wealthy preacher, lives in a multimillion-dollar mansion, drives luxury cars and famously preaches that wealth is not a bad thing, that Donald Trump's wealth is a sign he's been blessed by God. MARTIN: This is the prosperity gospel, right? - like, the idea that if you pray hard enough, you'll be rewarded or that your wealth is a sign that you have been blessed. GJELTEN: Right. And that brings us to a second faith leader who will be at Trump's inauguration, Paula White from the New Destiny Christian Center in Florida. She's perhaps the best-known example of a prosperity preacher. Listen here to part of one of her sermons, where she talks about how what you have in life is what God has given you. PAULA WHITE: You're either in a position of abundance or you're in a position of poverty. Now, that's every area of your life. That's not just financially. GJELTEN: Now, if you're wealthy like Donald Trump is, and you have a preacher who says your wealth is a sign God approves of you, you're probably going to like that preacher. And if there is one major element in Donald Trump's religious beliefs, it would be this prosperity gospel. Paula White has her critics among other evangelical leaders. But Trump has called her his spiritual adviser. And she endorsed his candidacy. MARTIN: OK. 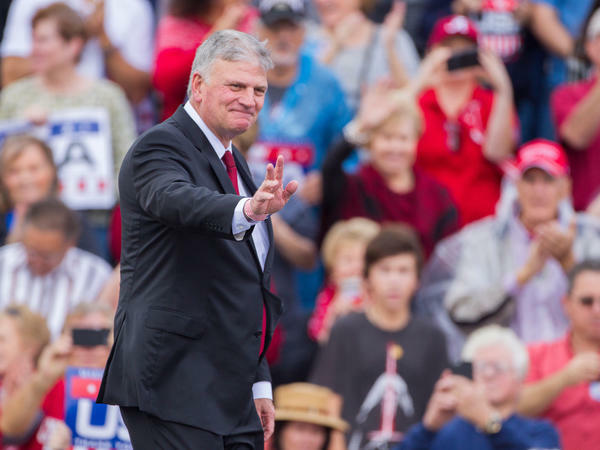 So then we have Franklin Graham, a name that will be familiar to a lot of people, the son of Billy Graham, who himself prayed at several presidential inaugurations. GJELTEN: Several, beginning with Richard Nixon on up through Bill Clinton. And Franklin himself prayed at the inauguration of George W. Bush. So his appearance here is hardly unprecedented. But he has something in common with Paula White. He, too, was a big supporter of Donald Trump during the campaign. Listen to what he said just last week about Trump's election in an interview with Lou Dobbs on the Fox Business Network. FRANKLIN GRAHAM: Everybody predicted that he was going to lose. And I just think it was the hand of God. I think God intervened and put his hand on Donald Trump for some reason. It's obvious that there was something behind this. And it was more than people understand. And I just think it was God. MARTIN: Divine intervention is tough to argue with. GJELTEN: Boy, you can't ask for a better endorsement than that. And, politically, Franklin Graham stands with Donald Trump on a number of issues. Trump, during his campaign, focused a lot of attention on what he said was the threat from radical Islam. And that's a theme Franklin Graham has hit over and over. MARTIN: All right. You said there was going to be a rabbi there. What can you tell us about him? GJELTEN: Right. Rabbi Marvin Hier, president of the Simon Wiesenthal Center in Los Angeles - the first rabbi to take part in a presidential swearing-in since 1985. MARVIN HIER: I'm delivering a prayer. I will hit modern themes. It'll be a short prayer. But it will reflect on the 21st century. GJELTEN: That's a clip from a TV interview on Fox News. And one other point here - Rabbi Hier has ties to Jared Kushner, Donald Trump's son-in-law now set to be a close White House adviser. Kushner's parents and Rabbi Hier and his wife are old friends. MARTIN: Kushner is Jewish himself. And Ivanka Trump has converted. MARTIN: So we have two more to go through. First, Rev. Samuel Rodriguez - what can you tell us about him? GJELTEN: Well, Rev. Rodriguez is president of the National Hispanic Christian Leadership Conference. And, you know, Hispanics are the fastest-growing evangelical group in the country right now, an important constituency. But Trump's views, especially his views on immigration, did not exactly go over well with this faith constituency. Rev. Rodriguez told me that Trump's invitation created something of a stir in his world. SAMUEL RODRIGUEZ: Of course, there was a bit of angst due to the fact that, throughout the course of his campaign, the rhetoric and the tone as it pertains to, particularly, the immigrant community did not line up with the ethos or the values of the NHCLC. GJELTEN: Remember, that's his church group. But Rodriguez told me, in the end, he could not pass up the opportunity to pray on what he called the quintessential political platform on the planet. But there's more to this invitation. Rev. Rodriguez is one of the more conservative faith leaders in the Hispanic world. And while he did not endorse Trump, he told me he's heard a change of tone from Trump in the last few weeks and now has high hopes for better relations between Hispanics and the Trump administration. RODRIGUEZ: Thirty percent of Latinos voted for Donald Trump. There's a great possibility that the president-elect and his team have come to the realization that this constituency can be engaged successfully. MARTIN: All right. So we've got one more faith leader to be introduced to. Cardinal Timothy Dolan doesn't need an introduction to many because he's the archbishop of New York, a prominent Catholic. GJELTEN: And, Rachel, in many ways, the least surprising of these faith leaders. President after president has asked a prominent Catholic bishop or theologian to do an inauguration prayer. And being New Yorkers, Cardinal Dolan and Donald Trump have known each other a long time. MARTIN: All right. Looking across the scope here, these six faith leaders - what can we learn, if anything, about Donald Trump, his philosophy, the way he sees the world? Can we draw any conclusions? GJELTEN: I'd say two big points, Rachel. With the exception of Cardinal Dolan, these are somewhat unorthodox choices starting with the prosperity preachers. There's no representative here of mainline Protestantism. And being out of the mainstream is entirely consistent with the way Donald Trump is approaching his presidency. The other thing is these choices reflect the importance he puts on loyalty. He's rewarding people who have supported him politically or endorsed his views or even offered a religious approval of his great wealth, a reminder that Donald Trump seems to prefer people he sees as being on his side. MARTIN: NPR's Tom Gjelten - he covers religion for us. Tom, thanks so much.